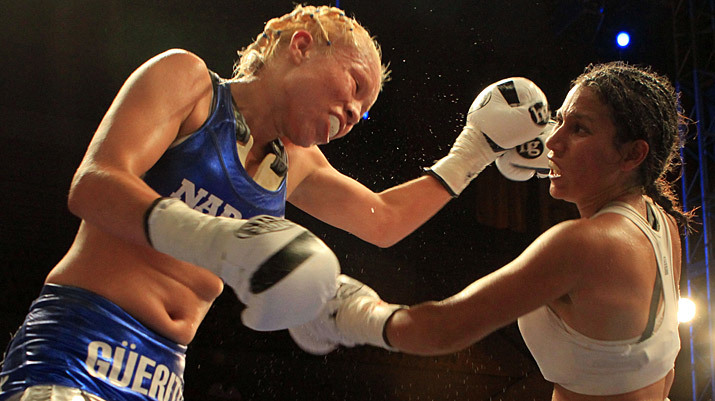 Ava Knight v. Arely Muciño IBF Flyweight title fight video from 10/30/11! 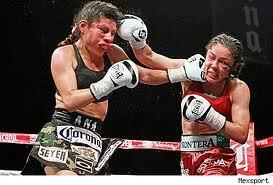 In case you missed it, here’s the Ava “Lady of Boxing” Knight v. Arely Muciño fight from October 30, 2011. California’s own Ava Knight (7-1-3, 4-KOs) won the IBF Female Flyweight Championship after a terrific body shot, left hook combination sent previously undefeated Arely Muciño (14-1-1, 8-KOs) to the canvas. 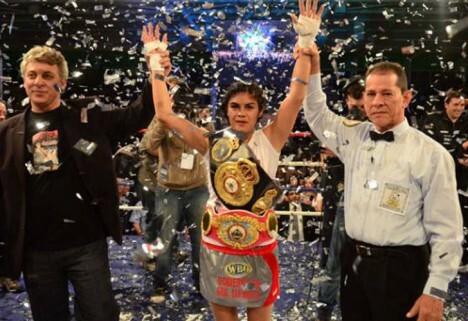 Mexico’s Arely Muciño had held the title since January 2011 when she defeated Chantel Cordova (9-3-1, 3-KOs) for the vacant championship belt. One hopes these two women warriors will fight again! Here’s a link to a great piece about the fight by Ryan Maquinana. 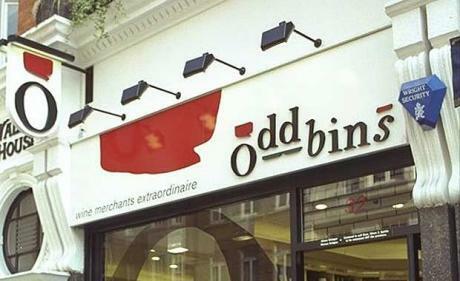 Another round of odd bins: Women’s Boxing around the globe! The Burqa Boxers of Afghanistan! My beloved Afghani Women’s Boxing team, coined the Burqa Boxers have hit the news again — this time in the Sydney Morning Herald. These brave young women and their coach continue to defy the odds just by showing up for practice twice a week! As quoted by writer Ben Doughty, Coach Mohammad Sabir Sharifi said, “”We will all work hard, and we will select the best, the strongest and the most talented and we will hope to have one of our girls represent our country at the Olympics.” Here’s hoping that they do. This highly recommended article and pictural essay can be found here. Irma “Guerita” Sanchez (20-5-1, 5KO’s) was sucessful in her quest for the WBF female flyweight belt against Panamanian Carlota Santos (5-2-4, 4KO’s) with a TKO victory in the seventh round of the bout. 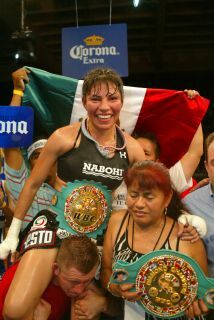 With her win, Sanchez becomes the first female Mexican boxer to hold two world championships across two weight divisions. The fight was on the “Puños de ierro” card promoted by Hector Garcia’s HG BOXING at the Coliseo Olimpico de Guadalajara, Jalisco on Saturday night (7/23/2011). Thank you Detroit Free Press! 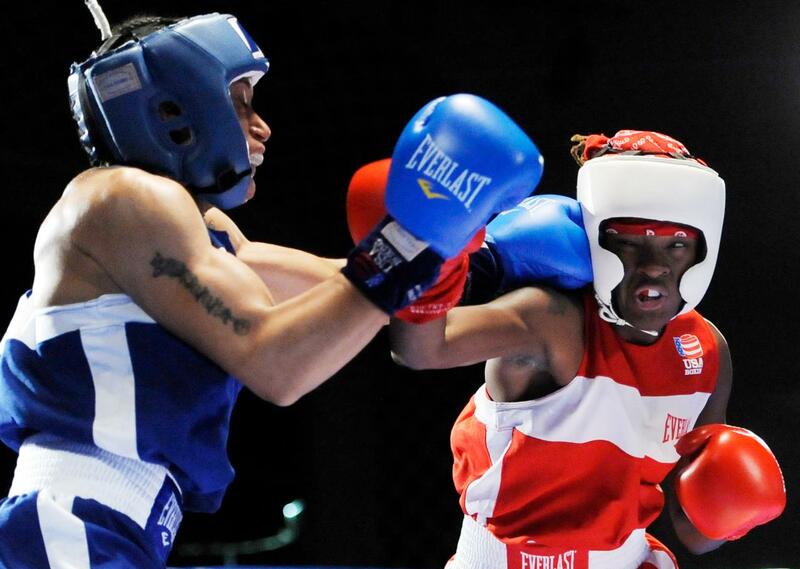 Jo-Ann Barnass writing for the Detroit Free Press has a terrific piece entitled, 2012 Summer Olympics: Three classes are not enough for women’s boxing that is really a must read. Barnass publicizes the fact the three Olympic weight classes (Flyweight-112, Lightweight-132, Middleweight-165) have effectively curtailed the Olympic dreams of many women who are unable to step up or down in weight enough to make one of the sanctioned weight classes. Her case in point is boxer Andrecia Wasson who won the world welterweight title in Barbados last year, but at 152 pounds does not easily fall into either the lightweight or middleweight category. 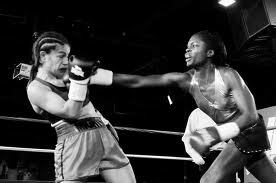 Girlboxing has to agree that the limitation on weight classes is unnecessarily hampering the opportunities for women at the 2012 Olympics and applauds the Detroit Free Press for running this important piece! The link to the piece is here. 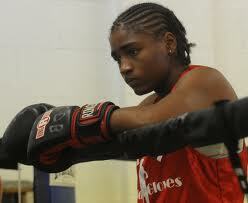 Women’s Boxing: Two upcoming world bouts to watch for! 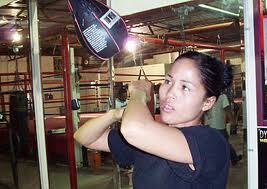 Women’s Boxing: Two upcoming bouts to watch for! Flyweight Championship battle in Mexico! 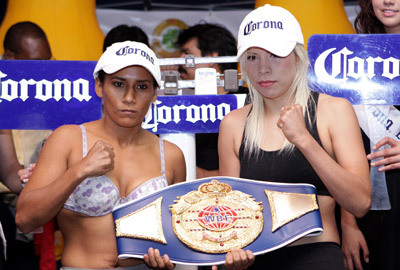 Championship boxing in the 109 weight division will pit Mexico’s Irma “Guerita” Sanchez (19-5-1, 5KO’s) against Panamanian Carlota Santos (5-2-3, 4KO’s) in a battle for the WBF female flyweight belt. Fighting on the “Puños de Hierro” card promoted by HG Boxing and Hector Garcia, Sanchez is attempting to make history by being the first female Mexican boxer to hold two world championships across two weight divisions. The fight will be held tonight at the Coliseo Olimpico de Guadalajara, Jalisco. The fights will be broadcast in Mexico by Televisa — and my guess is we’ll be able to catch fight the on streaming video as well as a YouTube posting a few days after the fight. World Title Middleweight Belt in Port-of-Spain, Trinidad! 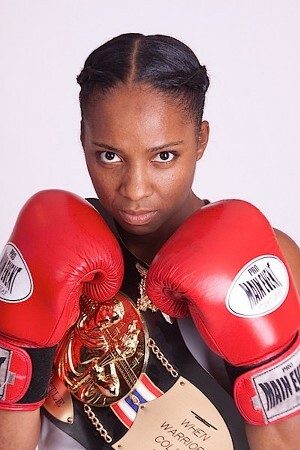 Tori Nelson (3-0-1) of Ashburn, Virginia will be flying down to Trinidad to face Las Vegas fighter, Lorissa Rivas (4-1, 3KO’s) to compete for the 10-round World Title Middleweight belt @ the Jean Pierre Sports Complex in Port-of-Spain, Trinidad and Tobego on July 29, 2011. The 10-round bout will be on the same card as the 12-round championship fight for the vacant 147 lb., WBC Caribbean Boxing Federation (CABOFE) title pitting Rumanian born, Montreal-based fighter Jo Jo Dan (28-1, 15KO’s) against Trinidad and Tobego’s own Floyd Trumpet (16-8-2, 9KO’s). In a nice piece by writer Jeff Schneider, Nelson is quoted as saying,”I knew that God was going to bless me with an opportunity to be a world champion, but never this quick. I know boxers who have fought longer and haven’t had a chance. This is a dream come true and truly a blessing.” The full feature article about Tori Nelson in Leesburg Today is here. There’s no word on whether the bout will be broadcast. Tonight! “Knock Out Cancer” fight card with Alicia “Slick” Ashley taking on Christina Ruiz for the vacant WBC Female Super Bantamweight World Title at the Hunts Point Market in the Bronx, NY! If you can’t get to the fight — you can find it streaming on GoFightLive TV for $9.99. The proceeds go to fight cancer — as worthy a cause as you could ever find. The link is here.